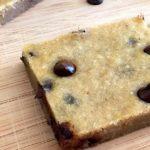 Try these amazing chocolate chip cookie dough bars! These are my new obsession! Since making them for the first time, there has not been a day that I didn’t have any in my fridge. They are my absolute favorite healthy dessert, hands down. These cookie dough bars have passed the test of some very tough critics, and I know you will love them too! They are gluten-free and low-fat with a healthy dose of fiber and protein, making them the perfect guilt-free dessert. Happy baking!! 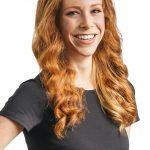 This recipe was adapted from Chocolate Covered Katie’s original recipe. Find it here. 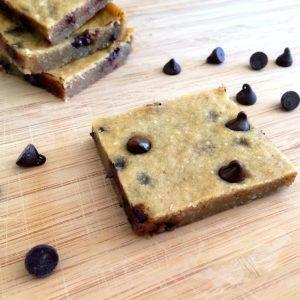 These chocolate chip cookie dough bars are gluten-free and low-fat with a healthy dose of fiber and protein, making them the perfect guilt-free dessert. Preheat oven to 350F and spray pan with non-stick spray (or line with parchment paper). If using a regular blender, mash beans in large bowl. If using a high-speed blender or food processor, skip this step. Add all ingredients (except chocolate chips) to blender or food processor, and blend until smooth. Transfer into mixing bowl and add in chocolate chips. Pour batter into pan and bake for 30 minutes (or until a toothpick inserted in the middle comes out clean).